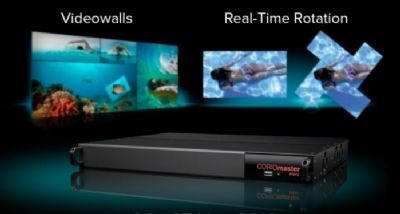 “The radical CORIOmaster mini design allows a 1RU system to perform the full range of demanding videowall processing tasks,” said Sean Burke, President, Nortek Technology Solutions Group. “Like its big brother, the mini achieves stunning performance through the patented TV One Parallel Processing architecture.” CORIO Parallel Video Processing Architecture tightly joins patented CORIO® video processors with up to 10 independent video scaling engines. This radical design supports up to 26 Billion video matrix calculations per second. To ensure optimal parallel bandwidth, video transfers between the CORIO video layer(s) and video I/O processors occur at an industry-leading 4 Gigabits per second per I/O channel. This design allows a single all-in-one system to perform the range of video tasks simultaneously, including: real-time 360o video rotations, multi projector edge blending, multi-window processing, smooth transitions, and more. This combination plus the mini’s software upgradeability ensures that customers maximize the long-term value of their video wall investment. The CORIOmaster mini delivers Real Time Video Quality with a less than two frame signal delay from input to output regardless of video resolution and frame rates. Only CORIO technology can massively parallelize video tasks to deliver the highest quality video possible at ultra-low latency. Complementing the processing skills of the mini is an unparalleled I/O versatility. Universal DVI I/O modules support the full range of analog and digital formats as well as universal conversion to virtually any HD or PC resolution. The CORIOmaster mini design further supports HDBaseT, 3G/HD/SD-SDI and future Cross-Fade and 4K output modules. This versatility gives users unmatched flexibility to configure the mini to meet every video wall need.